About Us - Website of pacifichillschessacademy! Ron Rezendes plays tournaments and speed chess at the San Diego Chess Club on Wednesday nights, since 1982! Ron Rezendes Jr. aka "Coach Ron"
“Coach Ron” trained under the tutelage of International Master Larry Evans for over 17 years, teaching chess in dozens of schools throughout San Diego County, day camps through the Balboa Park Educational Council (BPEC) at the San Diego Chess Club, and overnight camps in various locations throughout California for the Mountain Lake Chess Camp. His experience includes over 10,000 hours of classroom instruction! As a freshman at Santana High School he created the Santana Chess High School Chess Club and served as President until graduation in June 1984. In his sophomore year at Santana HS (1982) he was introduced to and joined the San Diego Chess Club. He's been a continuous member for over 30 years. 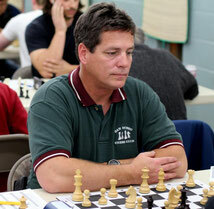 He was elected as the President of the San Diego Chess Club in 1996 and currently serves in that capacity after several re-elections by the membership. In 2003 "Coach Ron" was elected President of the Southern California Chess Federation (SCCF). An office he was re-elected for two more times in 2004 & 2005. He also served as an Organizing Committee Member for two US Chess Championships held in San Diego in 2005 & 2006. This provided a wonderful opportunity to bring some of the best players in the country to his schools during the events.